The new MICRO Golden Oval-In is our most advanced design and has our best performance. It still has the same three 18 AWG conductors but with a new design to give our best performance and with a smaller diameter. It has a hollow oval inside a hollow oval geometry for a faster rise time and better shielding. This cable is a true reference cable for the best systems.. Using conventional round cable is like pouring fine wine through a lead pipe. What comes out is definitely not what went in. Continuous Cast Copper (solo crystal copper) braids with our patented hollow oval design put nothing in the way of the musical signal. The new MICRO Copper Oval-IN packs a lot in a small cross-sectional area. Three 18 gauge conductors and FEP dielectric in a micro design give great performance in a compact design. These interconnects were designed using our patented hollow oval geometry to control current density in a form suitable for braiding from pure oxygen free copper. The signal lines are then wrapped with a shield to provide protection from EMI/RFI. THe result is a super quiet, extremely neutral cable, priced well within any budget. For audiophiles who don’t need XLR connections, we developed the superb-value Oval One interconnect. It uses a braided signal conductor in our proprietary hollow oval design along with a braided outer shield mated to a true 75 ohm RCA connector with a low-loss dielectric. Because Oval One is handmade using first-rate materials, it will outperform other cables costing many times more. The 100-percent shield coverage ensures the very low noise floor that’s essential to experiencing the entire dynamic range of symphonic music. The RCA connection is solder-less, using a compression contact technique that spares the dielectric from damage that heat from soldering can cause. This technique also eliminates the poor signal transfer that results from a cold solder joint. Our fussiness adds to the cost of the cable, but the performance increase is worth the added care. New OVAL IW interconnect. 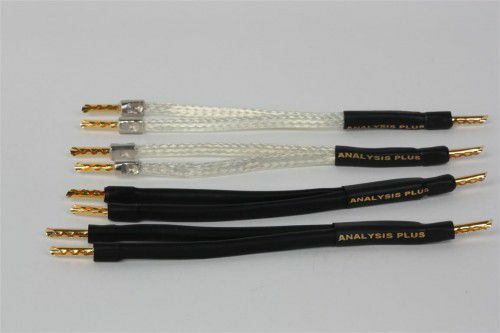 Made in USA low loss interconnect cable with Analysis Plus gold non-locking RCA for a great performing cable at a great price. Allows you to run a single long run of sub oval interconnect to your subwoofer. Simply plug the male end of the T connector into the sub and insert the long run into the female on the top of the T connector. Then connect the 1 ft. sub oval to the subwoofer and the other end to the female on the T connector. This eliminates unwanted pig-tail connections of a hard splice. The price is $42.90 for both of the items. The new SUPER SUB is our premium in-wall (UL CL3 and CSA FT4) rated subwoofer cable. It can be fitted with our new non-locking RCA connector or XLR connector. You have been asking for a premium subwoofer cable in a balance design that can be run in-wall. 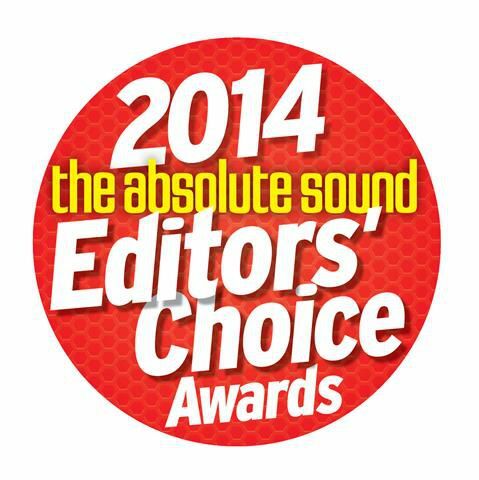 We are pleased to tell you we have the cable that will bring your subwoofer to life. This is a shielded balanced design to give you clean powerful bass at a great price. The cable uses Analysis Plus patented hollow oval design to give you tight clean bass. There’s nothing like a subwoofer to kick life into a film soundtrack or musical performance. A subwoofer brings the full power of realism to music and theater effects, but only if the signal from your amp arrives at the subwoofer intact. Anything added or subtracted from the signal degrades the listening experience, robbing low frequencies of their excitement. Analysis Plus Sub Oval interconnect delivers the pulse-pounding glory of musical deep bass response, not just the loud noise that other cables can convey. That’s because Sub Oval provides the optimal signal-to-noise ratio for recreating true and accurate low frequency performance. Exclusive hollow oval conductor geometry maximizes signal transfer. To minimize low frequency noise, we’ve decreased the loop area between the signal conductor and the return where noise most commonly occurs. Complete shield coverage and solder-less 360-degree compression connections also contribute to Sub Oval’s extremely quiet nature. And the low price is just as attractive as the performance. Allows you to run a single long run of sub oval interconnect to your subwoofer. Simply plug the male end of the T connector into the sub and insert the long run into the female on the top of the T connector. Then connect the 1 ft. sub oval to the subwoofer and the other end to the female on the T connector. This eliminates unwanted pig-tail connections of a hard splice. The price is $31.90 for both of the items. New Black Oval 12 is our best value for a high-end speaker cable. It uses the same patented hollow oval design as the Oval 9, but in a slightly smaller 12 gauge oxygen free copper. The OVAL 16 speaker cable is a UL CL3 rated in-wall speaker cable. It is made in the USA and uses our patented hollow oval geometry with two 16 AWG conductors for great performance at a great price. 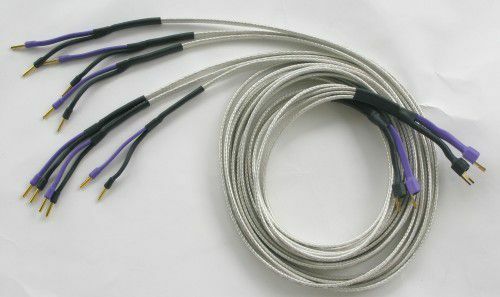 Picture of custom Tri-Wire speaker cable. Our jumper cables are basically 1 ft long pair of speaker cables. We can make with many different connector options (spade to spade), (spade to banana) or (banana to banana) are just a few of the build options. Shown in the picture from top down is Solo Crystal Oval 8, Big Silver Oval, Oval 9, Oval 12, Clear Oval, Silver Oval 2 and Chocolate Oval 12/2.